We didn’t all get to go to E3; it’s fair to say that most of us were left on this side of the Atlantic, watching all of the titles on display will little pieces of hope, curiosity and anticipation. 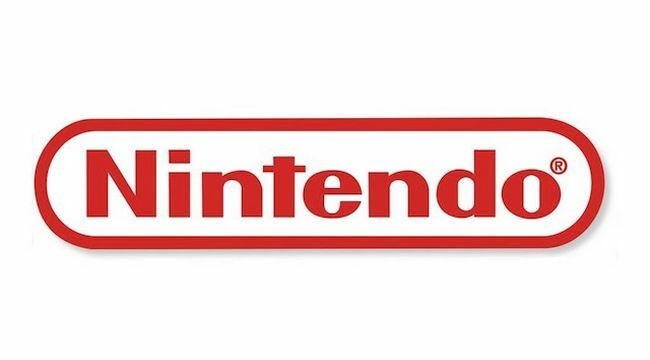 Nintendo clearly realised this, arranging for the less well-travelled part of the gaming press to take a look at some of their E3 line-up in central London. 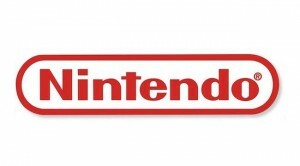 For starters, here is Capcom’s DuckTales Remastered, and Nintendo’s two Zelda announcements, Link Between Worlds and Wind Waker HD. One to bring a nostalgic tear to the eye of the older gamer, DuckTales is the HD remake of Capcom’s 1989 NES game. From the two levels that were available to try (Transylvania and the Amazon), this has been recreated faithfully – complete with the more challenging gameplay of an older game. 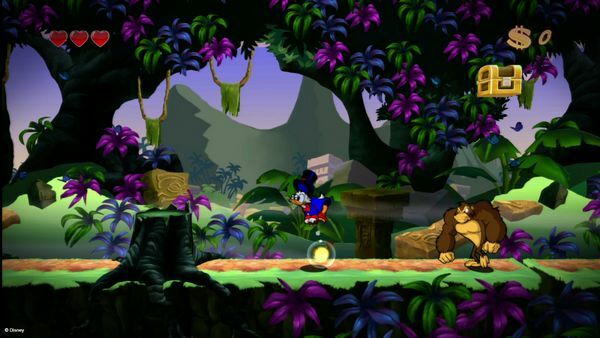 “Recreated faithfully” has still provided enough room for some creativity of course, with voice actors able to fill in the game’s dialogue, and advances in technology meaning the game does look like an HD version of the 1980s cartoon the original game was based on. As before, you play as Scrooge McDuck, travelling the world seeking treasure and pogo-sticking your way into trouble. This is old-school platforming, as it was handled for a fondly remembered title – the three life hearts you have are enough to stop the game feeling unforgiving, but equally there are plenty of things out there to take them away, from enemies pursuing you to traps to fall into. You may not need to be the greatest platformer to get through the areas, but it’ll certainly keep on your toes for hazards coming from unexpected directions. Specifically for the Wii U, the game is playable via the controller’s screen as well as the TV – and let’s be clear, this seems to be a running theme for Wii U games now, with one member of Nintendo’s team casually mentioning how busy the TV can get in a family home. While with some of the games on display the visuals are so bombastic that a larger display is welcome, for games like this it’s actually very comfortable playing on a smaller display. This made news when it was announced earlier this year – a sequel to 1991′s A Link to the Past on the SNES. And while seeing video of the game running suggested it evoked the feel of the original game as well, actually getting hands on confirmed it. From the game’s opening in the overworld – right outside that very familiar feeling house, complete with green-armoured guards running around, fans of the original will feel very much at home… right until the game throws a sleight-of-hand if you try and follow the route you would take in LttP. Link’s new trick of becoming a wall-painting does encourage you to look at the environments differently bars on a window no longer seem like a barrier, just as gaps between platforms seem less of an obstacle with a wall nearby. It wasn’t quite made clear how intrinsic this ability is – the demo version available had Link with equipment and the skill right from the start, although presumably both will be acquired more gradually in the finished game. 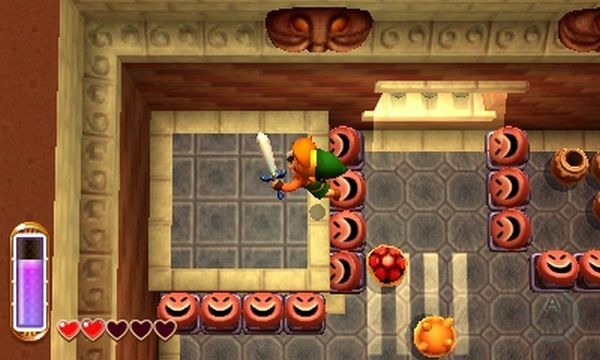 But by removing Link’s third dimension (briefly), the game has opened up new dimensions of exploration. And another Zelda game looking back at the series – although in this case as a complete remake of 2002′s Gamecube title. The improvement of the game to run in 1080 is an obvious step forward thanks to 11 year newer technology, but some of the other adjustments are only clear when you lay hands on a pad. The ability to play the game entirely via the display on the pad is just one, although you’ll naturally get more from having the main TV display. The gyroscope in the pad allows it to also be used to aim tools such as the bow or hookshot, while three tabs allow you to swap between a permanently open, allow your inventory to be assigned to buttons on the fly, or read messages. These are a replacement for the Tingle Tuner in the original game – Zelda players in the Miiverse can write messages for each other, which can in turn wash up on shore in your game, presumably allowing hints and tips to be offered (although how useful these may be presumably depends on those writing them). One other adjustment which has been previously mentioned is the speeding up of sailing. One of the big criticisms of the original game centred around the amount of open ocean players needed to cross, which by the endgame could include long distances. To address this, sail upgrades will now be available as the player progresses. 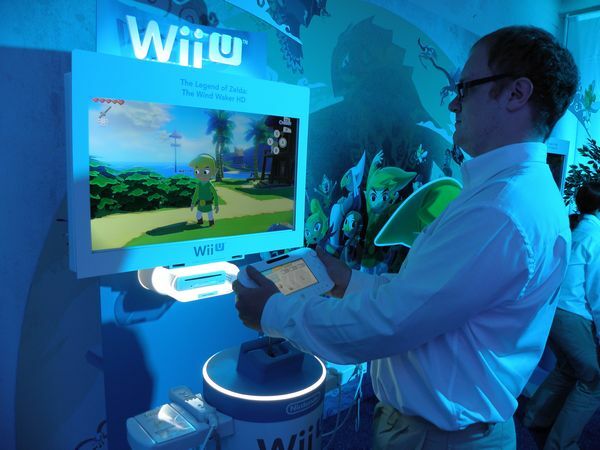 Although admittedly not as universally popular as Link to the Past or Ocarina of Time, Wind Waker is still warmly remembered by a lot of players, and it will be seen on the game’s release later this year whether these changes are welcome improvements or just changes to fond memories.